Our Processes | | Industrial Marking Services, Inc.Industrial Marking Services, Inc.
Our Processes - Industrial Marking Services, Inc.
Photo-metal combines the highest graphic resolution possible with incredible durability. That means you get a great looking product that can withstand even the most harsh environments and chemicals. Because of the balance photo-metal can strike between form and function, many government and aerospace companies frequently specify that photo-metal be used on applications where the physical demands will be great. Thickness ranging from .003 to .063. 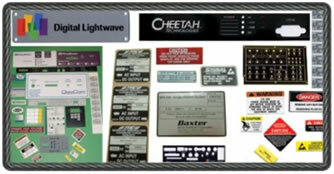 Manufactured prototypes, short run, long run, engravable and stampable, weather resistant nameplates for any industry. Basic drilling, punching, round cornering, and shearing are done in-house. Capability to fabricate any plate to any type of placement you may need. IMS offers a variety of photo-metal products as per military, UL and CSA specifications all of which can be viewed here. Call us today to find out how our photo-metal services can help you and your message stand out in the crowd! Call us today to find out how our experienced die cutting services can help you and your message stand out in the crowd!